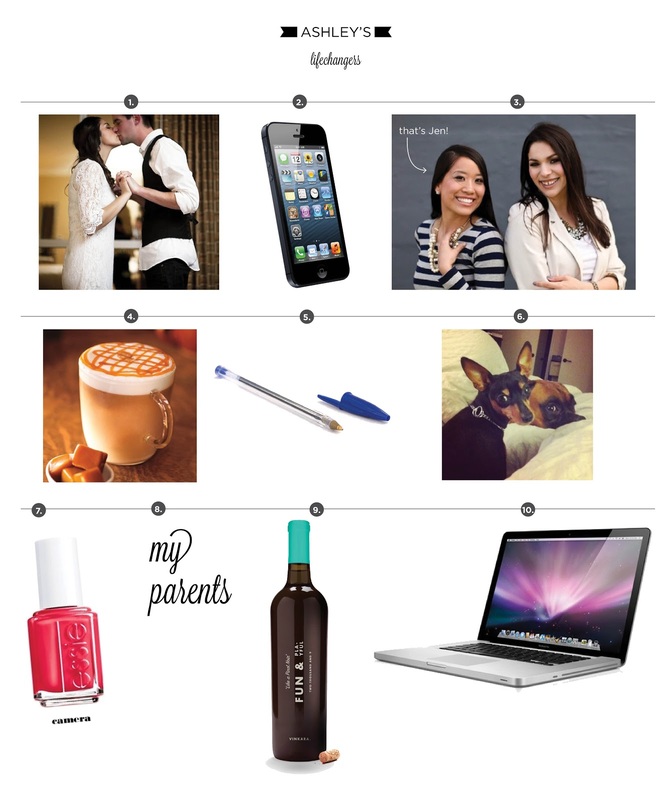 I simply love: ...Ashley's Lifechangers! 2. My iPhone 5. Yes, I know it's silly to consider a phone a lifechanger, but it is. I use my phone for so many things, and even use photography apps that help with my weddings like the Sunset/Sunrise app, that tells you on any given day what the sunrise and sunset will be. Super helpful when planning start times for sessions since my goal is to shoot either at sunrise or sunset! 3. My business partner Jen. She is, in many ways, my total opposite, but one of my best friends nonetheless. It's been absolutely amazing having someone to share this crazy journey into photography with and I truly couldn't ask for a better partner. People always ask if we ever wish we were going it "alone" and the answer is always NO WAY. 4. Starbucks iced grande skinny caramel macchiatos. Enough said. 5. My dogs Riley + Cooper. They are my co-workers since I work from home, my constant source of entertainment and definitely my "children". 6. Bic blue pens. The really cheap ones. Like the $5 for a box of 20 ones. I've been using them since I was in high school and have ever since. I just love them and the way they write. Except for the time I got a box of duds. Literally only two pens worked in the whole box! 7. My Macbook Pro. It allows us to do same day slideshows at our weddings, which has been one of best (and most fun) marketing tools. 8. My parents. They raised me to be independent and never scared of chasing my dreams, and always allowed me to take the path less chosen. I have no doubt I am in the photography world today because of them. 9. Essie Nail Polish. I'm obsessed. I change my nail color at least once a week, and Essie is by far my favorite polish! The colors are the best! Jen + Ashley are a two-woman wedding photographer team specializing in modern, fresh, and timeless wedding images. Ashley loves sprinkles, the color mint, living audaciously and dancing to The Wobble on wedding days. Jen is a persian cat collector, out eats all her guy friends, watches a mean game of tennis, and knows just as much about her car as she does her camera!